20th Gulfood exhibition encourages the multi-talented F&B industry experts to meet and discuss global food & beverage topics as well as doing business. The superb work of the Gulfood organisers made sure that the opening ceremony was a fantastic success. The event is a tremendous statement and wonderful example of how the coming together of thousands of food and beverage experts makes way for many, many relationships, both business and personal, developing in the 5 days of Gulfood. It is also a great place to ‘do business’. As well as the building of relationships there are many events taking place alongside the Gulfood exhibition. Dubai, United Arab Emirates: GCC nations can play a leading role in spearheading strategic public-private sector partnerships to tackle global food security concerns, according to a series of experts speaking at the World Food Security Summit – the opening instalment of this year’s Gulfood Leaders Events held on the sidelines of the landmark 20th anniversary edition of Gulfood. A top-level platform to build coherent global governance on food security policy and strategy, the World Food Security Summit brought together ministers, key global policy-makers and senior industry professionals from the private sector to discuss and debate sustainable global agriculture industry, policy reforms, international farmland acquisition strategies and domestic agriculture initiatives, amongst others. 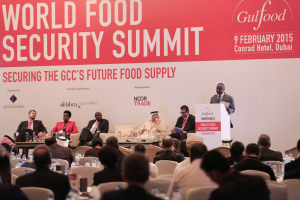 The World Food Security Summit was formally opened by Ahmed Alkhaja, Senior Vice President, Venues, Dubai World Trade Centre (DWTC), which organises Gulfood, the world’s largest annual food and hospitality trade show. The gauntlet was immediately picked up by His Excellency Essa Al Ghurair, Chairman, Al Ghurair Resources, who reiterated the importance of public-private sector collaboration to combat food security challenges: “Security of food supplies is the foundation of a stable and safe society,” said Al Ghurair. “Food security is particularly important for the Gulf and wider Middle East because of rapidly increasing population, a dearth of arable land and the shortage of water. These factors are not going to change – so we need to mitigate them with strategic solutions planned well ahead of time. His Excellency Khadim Abdullah Al Darei, Vice Chairman, Al Dahra Agriculture, believes the UAE is already piloting several public-private sector schemes: “Food security progress requires sustainable, long-term solutions and in terms of effective, responsible and ethical agro-investment, the UAE has merged the private-public sector divide very well. The UAE is in the corridor of many major producing countries and consuming countries. The UAE can facilitate the passage of food between Africa and Asia. It can be a win-win case for the producing country and the exporting country. With sustainable policies and strategies top of the Summit agenda, Quintin Gray, Agricultural Counsellor, Office of Agriculture Affairs, USDA, revealed five factors he believes should form the foundation of any international food security strategy. Alan Smith, Managing Director, Gulf and Pakistan, Mondelēz International, offered insight into how the private sector can aid the food security debate in a session entitled Increasing the Involvement of Corporates in Resolving Food Security Challenges. Other prominent industry le aders addressing the World Food Security Summit included: His Excellency Khalifa Al Ali, Managing Director, Abu Dhabi Farmers’ Service Centre; Ad Spijkers, Sub-regional Co-ordinator for Gulf Countries, Food & Agriculture Organisation – United Nations (FAO); Amin Khayyal, General Manager, DuPont; Bashir Yousif, Food Safety Expert, Dubai Municipality; Rayan M. Qutub, CEO, Industrial Valley – King Abdullah Economic City; Sanjay Sethi, Managing Director and CEO, Signature Agri Ventures Limited, Africa; Dr. Saad A. Khalil Esa, Director, Office of King Abdullah Initiative for Saudi Agricultural Investment Abroad; Robert Powell, Global Risk Briefing Manager; Senior Economist and Editor, Economist Intelligence Unit; Dr. Balgis Osman-Elasha, Climate Change Expert, African Development Bank; David Currie, Fishery & Aquaculture Officer, Food & Agriculture Organization of the United Nations (FAO-UN); and Bobby Krishna, Principal Food Studies and Surveys Officer, Food Control Department, Dubai Municipality, amongst others. The Gulfood Leaders Events continue on Tuesday 10th February with the Halal Investment Conference and end on Wednesday 11th February with the Food Franchising Conference. Part of the second annual Dubai Food Festival, a city-wide culinary celebration running throughout February, Gulfood 2015 is a strict trade-only event and is open to business and trade visitors. The show is open 11am-7pm from February 8-11 and 11am-5pm on February 12. 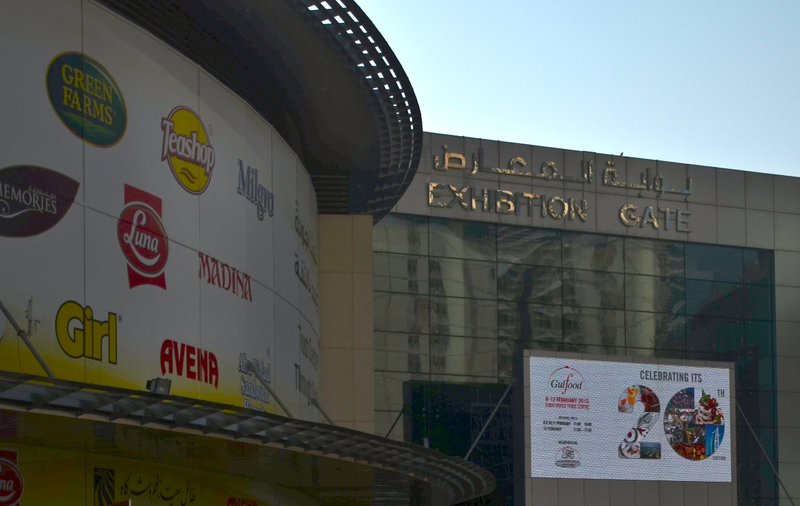 Visitors can pre-register at www.gulfood.com to save AED100 (US$ 27) on the on-site entry fee of AED250 (US$ 66.65). There are only a few days left to attend. You can register on-site and pay the standard AED 250 ‘at the door’. The above press release was issued by the ever-efficient, Dubai based communications agency – Mojo.